the front of the prism is a window to illuminate the viewfinder displays. 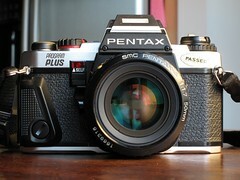 Pentax introduced the Program A (or Program Plus in North America) in 1984. It is a manual-focus 35 mm SLR camera. Metered manual exposure: Lens aperture set to a value, shutter dial set to 'Man'. Even 42 mm screw-mount lenses can be used for manual exposure, with a screw-to-K-mount adapter ('Mount Adapter K'). With screw-mount lenses, stopped-down metering is used. Programmed flash: lens aperture set to 'Auto' for programmed flash with a KA lens, or to a value for normal auto flash with any other lens. Shutter dial set to 'Auto' with dedicated flashes, or '100' for others. The shutter dial also has 'Lock', 1/100 (for flash synchronisation with non-dedicated flashes) and 'B' positions. In manual exposure, the shutter speed is adjusted using 'up' and 'down' buttons next to the shutter dial. The shutter is a vertical-travel focal plane shutter with metal blinds, and has speeds from 15 sceonds to 1/1000 seconds, plus 'B'. The shutter speed in use is displayed in an LCD display in the viewfinder. There is also a display for the aperture. In programmed and aperture-priority modes this shows the aperture to be used. In metered manual it shows, for example, '+2' when the meter reading indicates that the current shutter speed and aperture settings will overexpose by two stops, and '±0' when the set values agree with the meter reading. The viewfinder also shows over- and under-exposure warnings, a low-battery warning, and a flash-charged indicator when a dedicated flash is used. 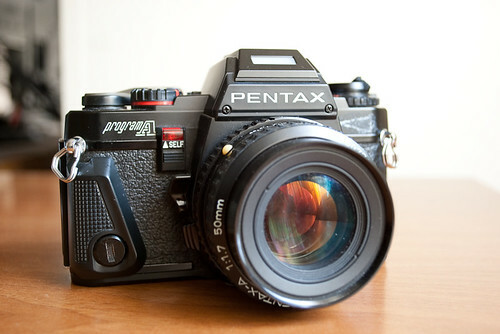 The camera is compatible with several Pentax dedicated flashes, but cannot support the through-the-lens metering capability of some of them. The viewfinder has normal split-prism rangefinder and microprism focusing aids. The camera has a depth-of-field preview lever by the lens mount, and a self-timer. It has a hot shoe and a PC socket. The camera has a finger grip attached to the front of the body on the right-hand side; this must be removed if a winder is fitted. The camera requires two 1.5V LR44 alkaline or SR44 silver oxide batteries, or an equivalent lithium battery. This page was last edited on 13 January 2013, at 06:46.